Step 1: Prepare the chicken. Heat the olive oil in a large frying pan. Add the onion and sauté for 4-5 minutes, until it softens. Add the drumsticks, the spices, the salt, the pepper and sauté for 5-6 minutes on each side, until they get a lovely brownish colour on all sides. Step 2: Add the molasses and mix until it coats all the drumsticks. Pour in the wine and wait for 1 minute until it evaporates. Transfer the drumsticks with all their juices into the ceramic pot. Add the pistachios and the raisins and mix. 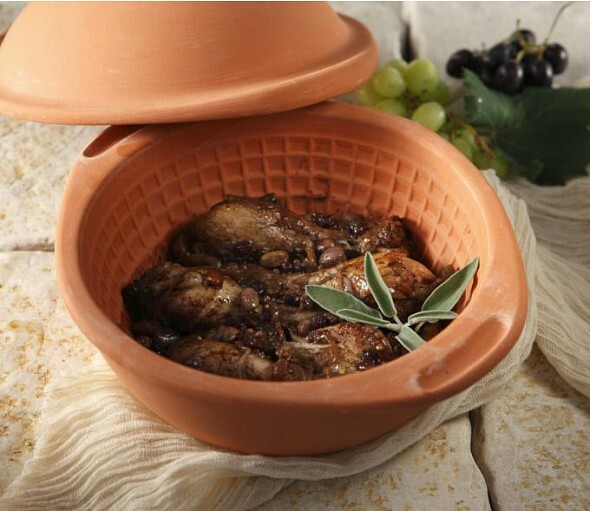 Step 3: Cover the clay pot with its lid and cook in a preheated oven at 200°C for approximately 30 minutes, until the chicken is ready and the sauce has thickened. Step 4: Serve with rice or french fries. A special dish made by using ingredients, like pistachio nuts and raisins with spices. It can be beautifully combined with rice or french fries as accompaniments.